that I needed to get them to London for 10am the next day. So, after some chasing of couriers & a trip to my local DHL, they were soon winging their way down to the MTV Studios. Then, at 2pm this afternoon, the programme started & some of my fascinators were modelled - one to match a prospective bride's outfit & the other being worn by one of the presenters. 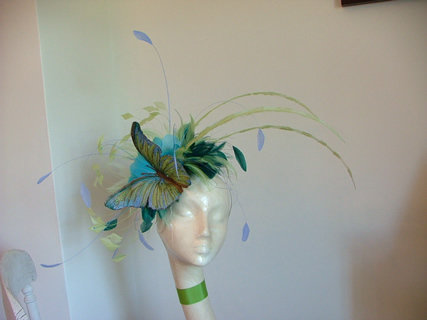 Received an email today from one of my lovely customers telling me that her Daughter's wedding was featured in the Monmouthshire County Life magazine, with pics of my customer & the hat I made for her. A lovely surprise today - I received the racing season brochure for Beverley Racecourse & the main picture when you open the leaflet was of me & 2 friends from Ladies Day 2009. 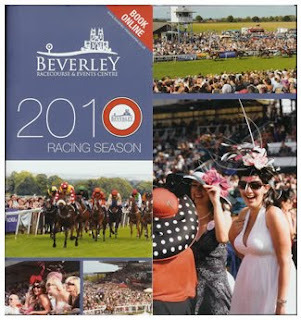 For more information about Beverley racecourse & The Journal Ladies Day, visit here. What fantastic friends I have - a brand new, fully liveried Mini Cooper (in Pink) for a Christmas Present. 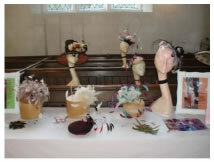 "Gifts Galore" again at Kilham Church. A really great day, with loads of people coming to see the local artists & to raise money for the church. Donated a gift voucher for £150 to Many Tears Animal Rescue Centre in South Wales to support their fund raising raffle. Pictured below is my lovely dog, Lily. The picture on the left is what she looked like after she was rescued from a puppy farm, with the other picture showing her after a few month's TLC. More information on this voluntary rescue centre is available here. 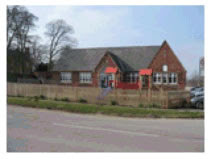 Over £1,000 raised for the village hall by the Open Studios & Open Gardens event. A great day had by all & the rain even held off until it had finished. I was hijacked by a complete stranger (Helen B) who wanted her picture taking with me & my fascinator during The Journal Ladies Day at Beverley racecourse. This was then featured in The Journal - thanks Helen ! 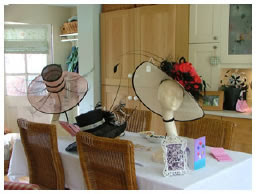 The local school has been raising funds, so I donated a hat for the raffle, with Mrs. Owen the lucky winner. 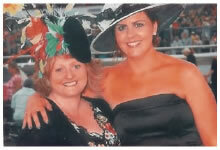 Following the competition which I held at The Driffield Show, the lucky winner Stephanie K is pictured here, with me, on Ladies Day at Ebor races in York. This article was also featured in The Driffield Times. I had a great day at The Driffield Show. Based in the Enterprise Tent (for new businesses), even the rain held off for the day & I met loads of fantastic people & had all sorts of hat-related conversations. 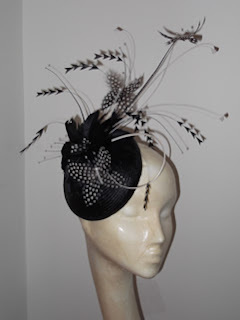 I was also awarded 2nd prize in the Best Retail Stand - will go for 1st prize next time ! 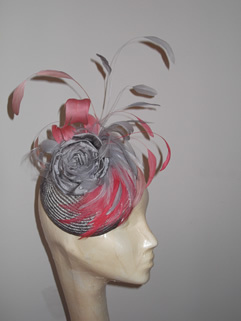 Have posted a few pics below to show some of hats & fascinators that I've been working on recently. Loads more to see at www.rachelwykes.com & just email me if you have any questions. Have finally got around to writing my first post & will do my utmost to keep things updated. 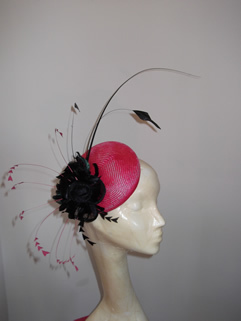 Anyway, to introduce myself, I am a milliner based in Yorkshire. 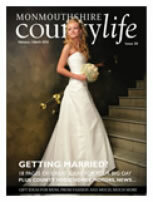 Married, I have an 8 year old son, 3 Labradors (2 from a rescue centre in Wales) & 3 chickens. So, there's always plenty going on to try & keep these posts interesting. 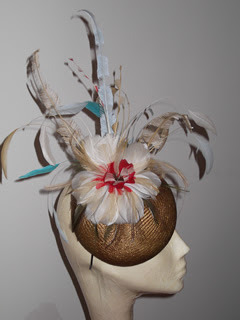 I will post more background information in the coming weeks & some pics of the various members of the family, as well as keeping you posted on new hats & fascinators that I've been making. 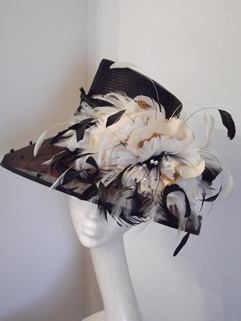 I've built up a great set of regular customers from around the UK & made hats for all sorts of events - weddings, horse racing meetings, trips to see The Queen & even had some featured on Sky TV's 'Angela & Friends'. Designs have ranged from the very discrete, all the way through to the most flamboyant (the customer's brief was "I want one bigger than any that my friends are wearing" !!). Right, that's it for now - I hope you'll come back again & let me know if you have any questions about anything.